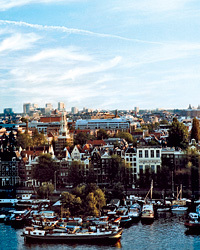 With the reopening of two blockbuster art museums and the rise of a fabulous new indie-restaurant scene, it’s a perfect time to visit Amsterdam. This year, an expected two million people will visit the Stedelijk, a world-renowned contemporary art and design venue, and the extraordinary collection of Vermeers and Rembrandts at the newly reopened Rijksmuseum. They’ll also get to experience the funky, forward-thinking restaurants and shops that launched while the museums were shut down. The 44-year-old brunette, rarely seen without a bright slash of red lipstick, is something of a poster girl for this kind of creativity. In the last two years, she has published three cookbooks—Home Made, Home Made Winter and Home Made Summer—that exemplify the indie spirit: They’re filled with her illustrations and do-it-yourself recipes, like hand-cranked ice cream, from-scratch mustards and Dutch-style beef sausages and croquettes. On a recent gusty Saturday, van Boven led me on a bike tour through Amsterdam’s newly exuberant restaurant scene. With her Dutch farm-fox terrier, Marie, comfortably tucked into the handlebar basket, we boarded a small ferry crossing the IJ river toward North Amsterdam, a Blade Runner-like landscape of industrial buildings that is fast turning into the city’s dynamic new creative center. Hovering above the waterfront was another recently refurbished museum: the white, sleek, angular Eye Institute, one of Europe’s most impressive film archives. Originally headquartered in the leafy Vondelpark, it has drawn more than half a million visitors to this former no-man’s-land since it reopened last spring. We disembarked and cycled a few minutes to Café Modern, a just-opened restaurant and boutique hotel from restaurateur Niels Wouters. In 2006, Wouters saw the neighborhood’s potential and launched Hotel de Goudfazant, which is not a hotel at all, but rather an edgy bistro in an old factory that he decorated with a massive chandelier of glass bottles and several vintage cars, including a Ferrari Testarossa. His new place, Café Modern, is a hotel, with three floors of apartment-like bedrooms built in a former bank—one bathroom is in an old safe. The hotel restaurant, which van Boven describes as “chic without being too chic,” serves comforting, rustic dinners meant to make guests feel at home—pistachio polenta with scallops; hanger steak with sauerkraut. Café Modern and Hotel de Goudfazant have proved that, in Amsterdam, culinary destinations can help transform formerly derelict neighborhoods. De Pasteibakkerij, a charcuterie atelier in an old butcher shop, is slowly doing the same for Rivierenbuurt, a gritty district south of De Pijp. 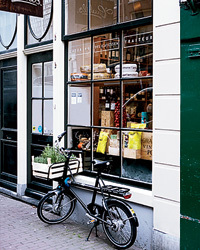 Co-owners Floris Brester, a childhood friend of van Boven’s, and Diny Schouten, a 60-something former journalist, preside over a bright storefront lined with shelves of cookbooks and butchery manuals. When we were there, a table near the window held shaved lemons, an open wine bottle and a platter of local cheeses; a shelf served as a stage for a collection of plastic animals. Since Brester and Schouten opened De Pasteibakkerij about two years ago, their artisanal meats have become mainstays on menus around town. On Fridays and Saturdays, visitors can buy terrines and sausages, along with sandwich supplies like rye bread and raw butter. When we arrived, Brester was wrapping up blood sausages, his specialty, while Schouten was packaging goose rillettes. Schouten explained that they often work with wild goose because the overpopulation of the fowl in the Netherlands means there’s always plenty of meat; indeed, the government requires the geese to be culled. We found goose on the menu at several restaurants. Using every part of the animal and sourcing meat that is ethically hunted or raised is a big part of the local punk food manifesto. So is occasionally sticking it to food safety laws. Until recently, when the city’s health department intervened, a restaurant called As within a former ’60s modernist concrete chapel let pigs wander across its grassy outdoor seating area. Here, chefs Sander Overeinder and Luuk Langendijk cook only with fire—on a grill, in a wood oven or on an antique gas stove from the original chapel—and then prepare dishes on a giant slab of stone. Anchoring the candlelit circular dining room at As is an altar-like bar displaying baskets of fresh bread and giant glass jars of pickled vegetables (grown on-site) resembling religious offerings. 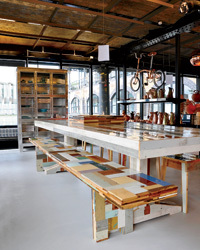 Communal wooden tables radiate out from the center like the spokes of a wheel. This is rustic food raised to the highest level—veal liver with grilled polenta, kale elevated by a puree of Cevenne onions and anchovies. Van Boven took a bite of sliced celeriac, which was nearly as creamy as the Tête de Moine cheese served alongside. She asked how the kitchen prepared the root vegetable and learned that the chef had wrapped it in a salted-dough crust and slow-cooked it for hours in the wood oven. When I met van Boven at her own restaurant, Aan de Amstel, I found her cousin Joris Vermeer illegally slow-cooking a suckling pig in a small portable charcoal grill outside on the sidewalk. The two of them opened Aan de Amstel seven years ago as a breakfast-and-lunch place, only to turn it into a dinner spot in 2011. Inside the long, narrow space—a former snack bar—a crowd of mostly locals was squeezed around the dozen small tables that line both walls. Van Boven and Vermeer renovated the white-tiled interior entirely on their own, painting the small bar an indigo blue and attaching adjustable, accordion-style desk lamps to the walls. The playful design details—like the cigarette-smoking deer head that hangs over the kitchen entrance—continued on the plate. Snails are tucked inside the beef marrow of a bone sawed in half, and lemony beans lie alongside a smoked pig’s head from De Pasteibakkerij. 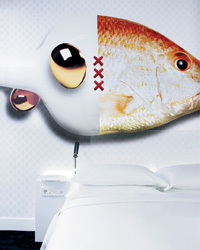 Berlin-based Gisela Williams is the European correspondent for F&W. She also contributes to the New York Times.